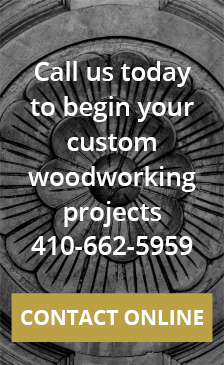 Located in Baltimore Maryland, TCS Woodworking offers the finest in high-end custom cabinets as well as custom furniture for your home or office. You name it and we’ll design and build your custom furniture or custom cabinets according to your specifications. At TCS Woodworking, we produce all custom, high-end office as well as home furnishings using both domestic and exotic woods. Designed to keep its value generation after generation, our beautiful wooden cabinetry stands the test of time. Our aim is to accommodate all of your furnishing request. Whether you need custom built office furniture, custom kitchen cabinets, custom furniture for your home or office, custom closets or something altogether different. We produce only the highest quality in home furnishings, as well as custom cabinets. Keep us in mind if you would also like to have your office function more efficiently or make a great impression on your clients. We design and produce professional-looking custom built office furniture. We produce reception desks, conference tables, custom libraries or file shelves, office kitchenettes, as well as anything else your business needs. Depicted in these photographs are gorgeous bathroom vanities and a tub surrounded by exotic quartered sapele wood. We don’t use shortcuts or assembly-line techniques…each piece is also individually hand crafted and finished to your specifications using the finest woods and quality hardware available. If you are an architect or designer looking for quality and reliability in your projects, feel free to give us a call as well.